This story focuses primarily on the heroine Rin Toosaka. After her father's death, Rin enters the Holy Grail War as the sole heir to the prestigious Toosaka Household, with her servant Archer. But, she soon finds out that Shirou Emiya, a boy from her high school has gotten himself involved in the battles and unexpectedly saves him when he is fatally injured. Episode 0 was previewed at screenings in Osaka, Los Angeles, France, Germany, and Korea on September 28, 2014. Regular broadcasting was on October 5, 2014. Here we are with another positive review for Ufotable and it’s Type-Moon works…and well, they deserve it. 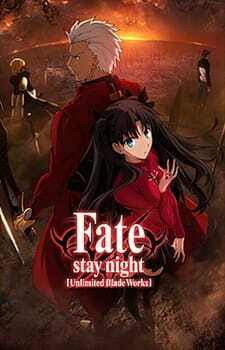 Once again they shown their strength with great care and attention and brought it all to life this time with Fate Stay Night’s Second Route – Unlimited Blade Works, focusing on Rin Tohsaka specially for this prologue. So naturally this episode starts with her, focusing on what’s going on with her life and what’s about to happen so it prepares you for the fifth Holy Grail War. This long episode dubbed as episode 0 (smart move) tries to make you ready for what is about to come and as a prologue it really covers what needs to be covered very well. Just like previous wars, there has to a summoning ritual first. After the introductions we get the famous summoning scene and Rin's banter with her new servant Archer. Story telling here is simply amazing and there is a good flow and order for events. We get to know Rin, those around her and her desires, plus we are fed with information about how things work which is very helpful if you are new to the fate universe, and it all ends with what Rin desired the most…Saber. (also nitpickers can't say why Rin screwed up her summoning because even that is covered) Plus the attention to some details is already easily noticeable in the story and also visually.We are treated with a good orchestrated fight scene and on top of that it is visually a pleasure to watch as well even if you already know what will happen plus we get to see an encounter filled with spoiler(depends how you think about it) too! Basically while this episode is satisfying for Fate fans (well at least as long as you don’t hate Rin) it can also be good for newcomers although I am not suggesting to start from here but if you do you can probably handle it and it won’t be that much confusing. If you are new you might think there is already a movie for this, well we (most of us anyway) pretend that’s not true since it is done by studio DEEN. While it might be considered good on it’s own it leaves lots of things out of it so just watch this one and focus on the TV version done by Ufotable (there is also Fate/stay Night anime that focuses on the first Route of the Visual novel but again Studio DEEN didn’t do it justice, I suggest you read the Visual Novel for that but it’s not bad on it’s own, until you read the visual novel that is then it might make you angry). Anyway whether you are an anime fan or western animation fan this season is great (for example new Fate and new Mushishi for anime fans and Korra Book 4, TMNT S3, Star Wars Rebels! for western animation fans) and hopefully they all will meet the expectations till the end and Fate UBW TV already passed the first test with Episode 0. Going into this anime, my expectations were very high. Normally I can manage them, but having immersed myself in the world of Kinoko Nasu through his masterful "Garden of Sinners" series and Gen Urobuchi's prequel Fat/Zero, I truly wanted this to be the definitive version of Fate/Stay Night. This prologue, if it can be believed, met my high expectations. It follows the adventures of Rin Tohsaka, a high school student descended from a long line of mages, and her summoning of her Archer servant. The episodes begins rather slowly, mirroring Rin's initial drowsiness, yet succeeds in establishing her character with minimal words; her mannerisms, expressions and treatment of others are sufficient exposition to display her character, and this characterization extends beyond just her. This school itself, due to masterful lighting and shading techniques, is portrayed as a safe, carefree environment where teenagers can gossip, laugh and enjoy themselves. The side characters are serviceable here, never becoming obnoxious, and serving as further foil for Rin, though they're too minor to seriously improve or ruin the episode. Another aspect that deserves praise is how much expression the characters have, which was admittedly a weaker point for both "The Garden of Sinners" and "Fate/Zero". This makes the characters seem more lively, helping to increase the prominence of character traits, ranging from Archer's calm and sardonic attitude to Rin's more flippant and demanding demeanour. As many are aware, Ufotable are the masters of atmosphere, subtly lacing many scenes with a small does of appropriate seriousness, comedy or danger. But, moving away from subtlety, the action sequence at the end is simply a jaw-dropping spectacle. It features more gradients than the average mountain, more fluidity than water and more impact than a sledge-hammer. Not only is it a visual spectacle, but a directorial one as well. Like Rin, Lancer is given character through his movements alone; bestial and confident, yet fast and sharp. His battle style contrasts the much more snaky and agile approach of Zero's Lancer through a display of fast and furious lunges and slashes. The battle's intelligence not only resides in the individual character movements, but their interaction with each other. For example, Archer is show to be hiding his techniques while trying to find Lancer's weak point, trying to stay alive and make sure not to provoke him into attacking Rin. This style of fighting more clearly reflects how experienced veterans would actually duel, and makes for some immensely satisfying viewing. The voice actors help the drama seem real, having matured into their roles through the Studio deen adaptations and Visual novel voice-overs. Needless to say, they have never sounded better. I sincerely hope the English Dub can do this series justice, as I believe it has great mainstream potential, even to those who have never seen a Type-Moon project or, indeed, any anime, before. The episode ends on a high, yet satisfying note, assuring fans and promising audiences that this was what the had been waiting for. Fate/Stay Night: Unlimited Blade Works' Prologue is a fantastic introduction in both characterization and tone of what is sure to be one of the biggest animes of the year. This definitely exceeded my expectations. It was adapted to the prologue of the visual novel very nicely. All aspects including the animation, art, BGM and ambience/atmospheric feel were all executed superbly within the hour. Even for this first episode, the animated fight scenes had me blown away already. Simple character movements such as dashing or leaping and sophisticated mechanics such as momentum or speed were presented in an unbroken and uncluttered manner, allowing viewers to be able to follow every action happening in each scene or frame and hence, be entranced in the battle sequences the entire time. Ufotable have also done an amazing job with the selection of the dialogue to be presented or omitted. The character interaction and development between Tohsaka Rin and Archer definitely does this justice and speaks for itself. Not to mention, all characters were voiced perfectly. The choice of sound effects and background music provided a reminiscent feel of Fate Stay Night and Fate/Zero but still remained fresh as is appropriate for this new adaptation. Overall, the mood and setting for the anime was well established within the hour as seen from the perspectives of the "Red Flower" and "Nameless Hero". Such amaze. Much wow. So excite. My first review on MAL since EVER! Being a fan of the VN for some time now and looking back at the horrid adaptions that came with Studio Deen, could see why some people would be turned way from anything related to Type-Moon. I rated the 2006 highly at first, because I didn't read the source material. But after reading the VN, I dropped the Deen produced verison, because I felt they didn't do the VN any justice at all. The chopped, hodge-podge of mess made me think that FSN ran it's course and no one would give it's adaption it right deserves. Ufotable is no stranger to Type-Moon works; adapting F/Z and Kara no Kyoukai into masterpieces that portray the messages it's creators wanted into a different medium to reach the people who aren't familiar with the source. So, ufotable adapted 2 hour long prologue (by my reading) into a 45 minute OVA. The result: //head explodes. Art and animation was very fluid. The battle between Archer and Lancer was animated so well that it seemed like it came from the VN in terms of epicness. They kept to the story to almost a T. Showing the slice of life Rin, before she became a master and following the troubles she causes afterwards. A lot of internal monologue from the VN was cut, but the overall plot wasn't effected. That impressed me. Character development between Rin and Archer was scripted really well. Writers did take care into strengthen Rins bonds with Archer given the amount of time they had. Props for that. My only qualm was the music. For nostalgic sake I was hoping they use more tracks from the VN, but this only nit picking on my part. Overall the music was outstanding as it set the mood to whatever situation the characters were in. Overall, very good job on ufotable keeping true to the source material. I didn't this review to be a comparison between the VN and this OVA/Special, but wanted to dispel any doubts anyone may have if they're new to the series or the VN purists who were turned off from the 2006. Granted, the show hasn't aired yet, but given what I've seen from the prologue, I believe FSN is in good hands. In a nutshell: Type-Moon + ufotable = EPIC! 'nuff said. Is there a huge flaw or am I missing something? Just Who Are the Servants of Fate/Stay Night? Fate/Stay Night: Unlimited Bladeworks is an intense anime filled with action, moral conflict, and exciting characters. It may be a fantastical show, but the Servants a.k.a. "Heroic Spirits" are actually based on our own history and mythology! Ever wonder why anime and manga feature characters with freakishly huge anime eyes so often? Well, here's a bit of information on why and how such a signature style choice is part of what makes this art form so awesome!